I just wanted to show you the finished mini I’m giving away over on Instagram (I’m Lemonshark if you’d like to try your luck). This little mini was designed and made for the giveaway. I used some of my all time favourite scraps, such as Flea Market Fancy by Denyse Schmidt, Architextures by Carolyn Friedlander, Summersville by Lu Summers and some Tula Pink. You can’t go wrong with Tula Pink. The whole thing was pieced and quilted in Aurifil 50wt (no 2600, my favourite). For the quilting I did some stitching in the ditch and echoing as the quilt is busy enough as it is. It was appliquéd on some grey Essex linen and bound with more of the yummy Tula Pink print I used. This mini mini finishes at 13,5″ and I’m in love with it. It’s going to be a little difficult to give it away but a promise is a promise. I’m thinking of putting the templates for this mini up on the blog. 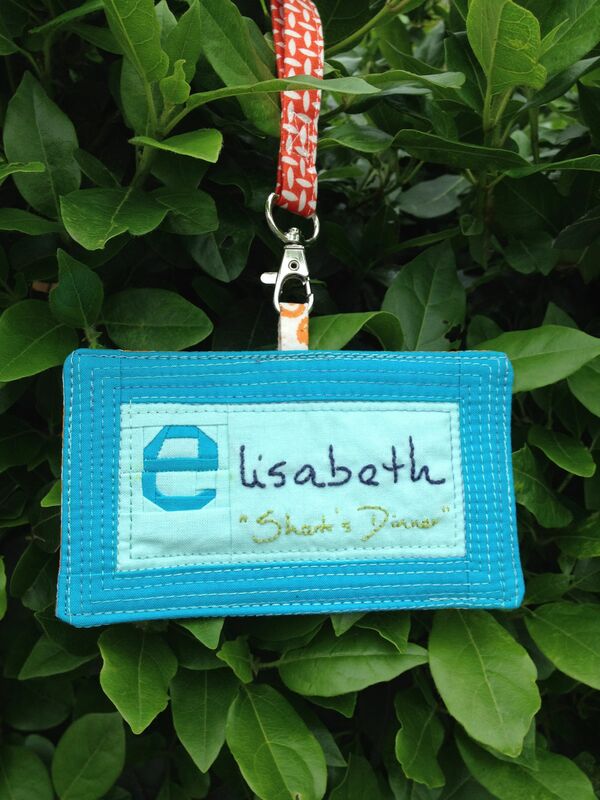 This will then be the last pattern on here as I’m going to open a shop on Craftsy. 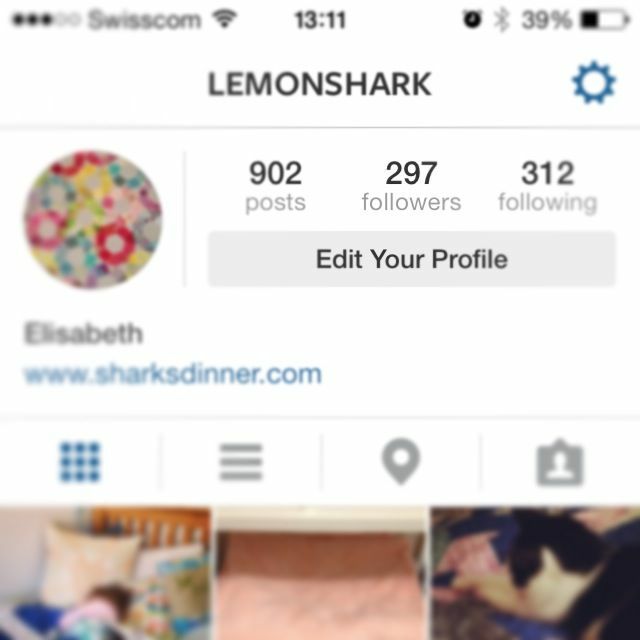 Last Saturday I noticed that I had 297 followers on Instagram (I’m lemonshark on there). I love Instagram because you can easily upload a picture of what you’re working on and get feedback from likeminded people. Anyway, I posted a picture of this number and said I was going to organise a giveaway of an EPP mini once I reached the magic number of 300. Imagine my surprise when I was tagged by Karie (karietkq on Instagram) who had posted a collage of some of my EPP designs and suggested to her followers that they should follow me. Within half an hour I had ten more followers and by the end of the day 46! This little butterfly was designed with one specific task in mind: to use up even my smallest scraps of Liberty Tana lawn. The butterfly finishes at about 9″ x 12″ when printed out at 100%. For my purpose, however, I printed it out at 75% as I wanted to make sure I could use up even the tiniest of those blue and green scraps. The antennae are free motion quilted in a variegated Aurifil 40wt (no 4669) which I bought to quilt my Churn Dash quilt. 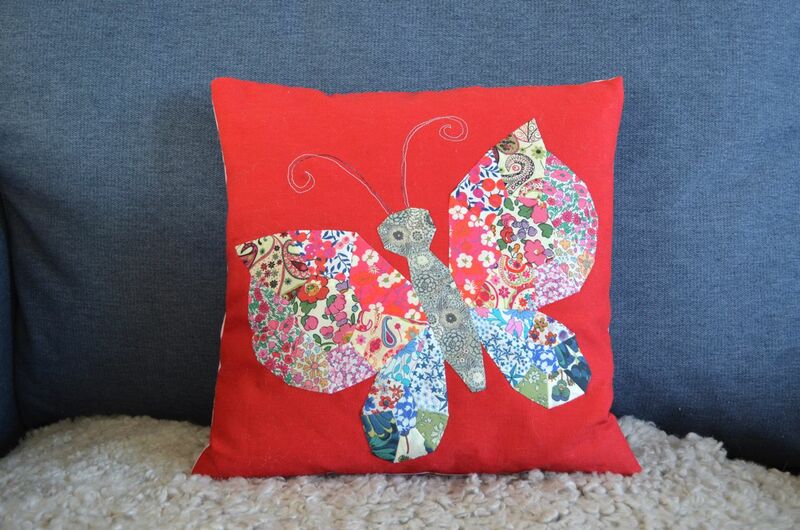 The butterfly itself was pieced with Aurifil 50wt (no 2000) which is a perfect match to many of the Liberty lawns. I appliquéd it onto a red cotton/linen fabric that I’ve had in my stash for a few years. I auditioned different colours for the background but found it nicest on the red. Funnily enough, when I popped it onto some white, the butterfly looked really washed out. All of the Liberty lawns came from Ali’s shop Very Berry Fabrics on Folksy and I already have plans to buy more (don’t tell my bank account, I can already hear it groan) as Ali sent me some scraps with my last order and I’ve completely fallen in love with one of them. Sadly she doesn’t seem to have any in her shop at the moment but you can be sure that I will be stalking her in the next few weeks. This is my third finish for Q1 of the FAL and I’m very happy about that. I really would like to make one of these butterflies in solids as I think it would look stunning in a rainbow of colours too but I’m going to be good and continue with my list before starting something new. So far, I’ve made my EPP patterns available for free and I want to do this with my last two, Butterfly and Liberty Bloom, too. They just need a little more work before I can upload them to the blog. Hopefully, they should be done by the end of this week. Afterwards, however, I’m thinking of opening a shop on Craftsy or Etsy and asking for a small contribution for my patterns. What do you think? 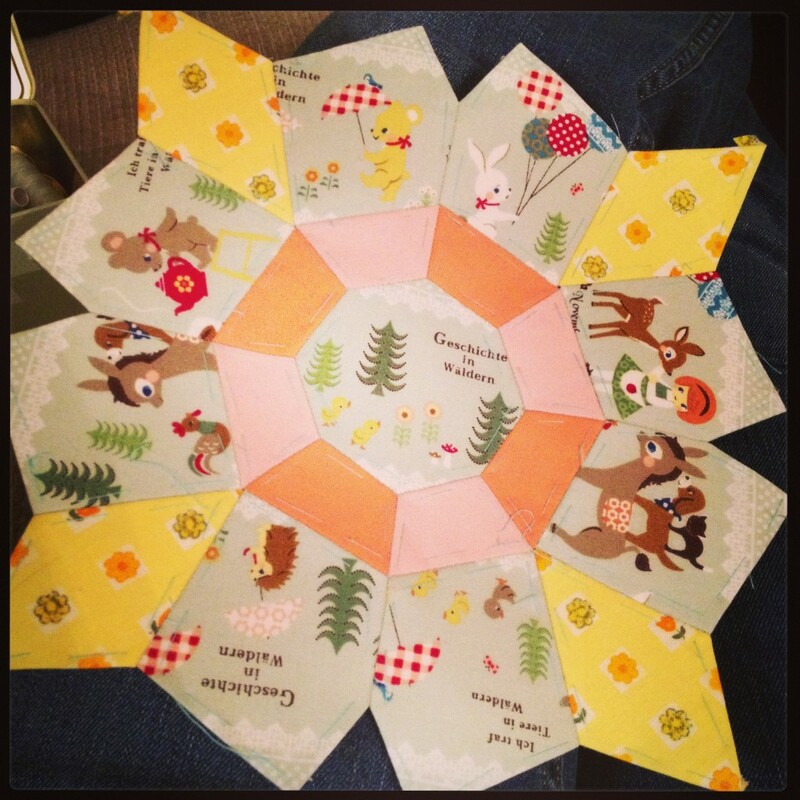 Would you pay a couple of pounds for my EPP patterns? I’ve finished my Doll Quilt Swap 14 mini quilt and I’m really very happy with it. 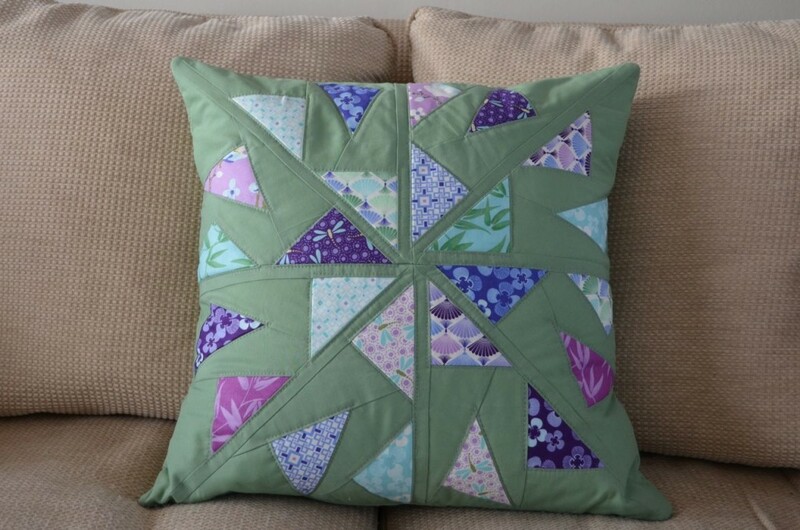 The only thing I’m a little disappointed with is that I couldn’t do more quilting on it. 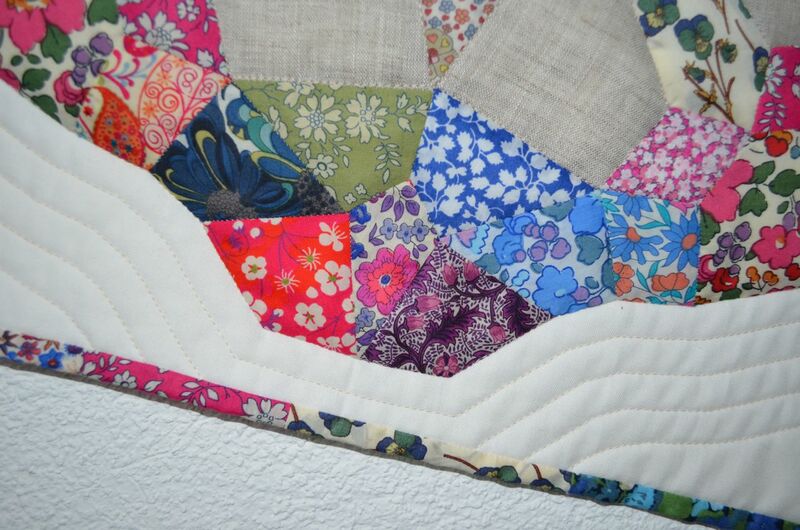 Once I’d finished stitching in the ditch around the ‘bloom’ and the linen pieces my back gave out to me. I realised that I wouldn’t be able to sit at the machine much longer and therefore simply echo quilted around the bloom a few times. I quite like the simplicity of it, it really lets the fabrics do the talking. 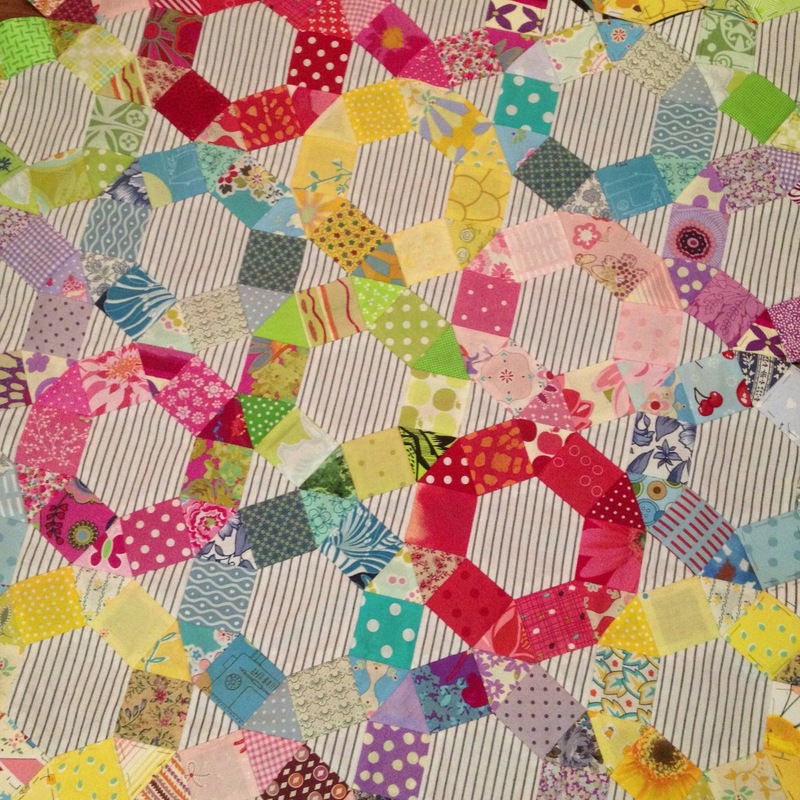 The mini’s progress was stalled when I ran out of Liberty scraps that were big enough to finish the last few pieces. I ordered a mini bundle from Ali’s shop Very Berry Fabrics on Folksy and it arrived promptly a couple of days later. Thank you so much, Ali, for such quick service! 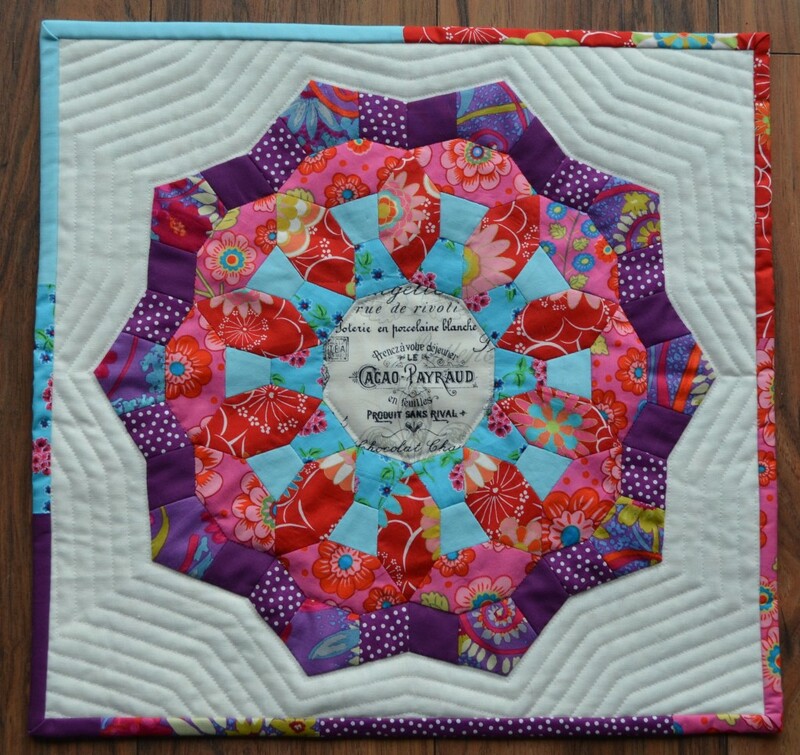 The Liberty Bloom is pieced and quilted with Aurifil 50wt, my favourite thread of all times. 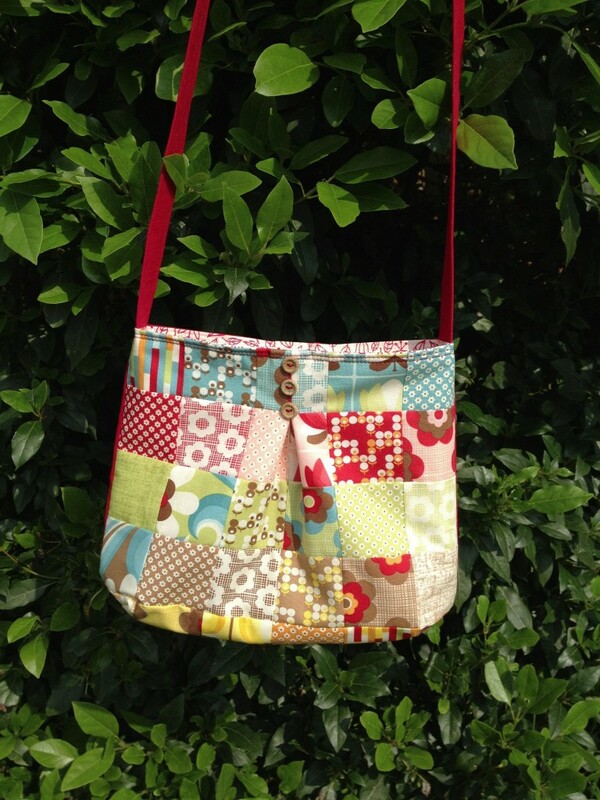 It finishes at 19″ x 19″ and has a scrappy Liberty binding which I am very partial to. I just hope my partner loves Liberty Bloom as much as I do. 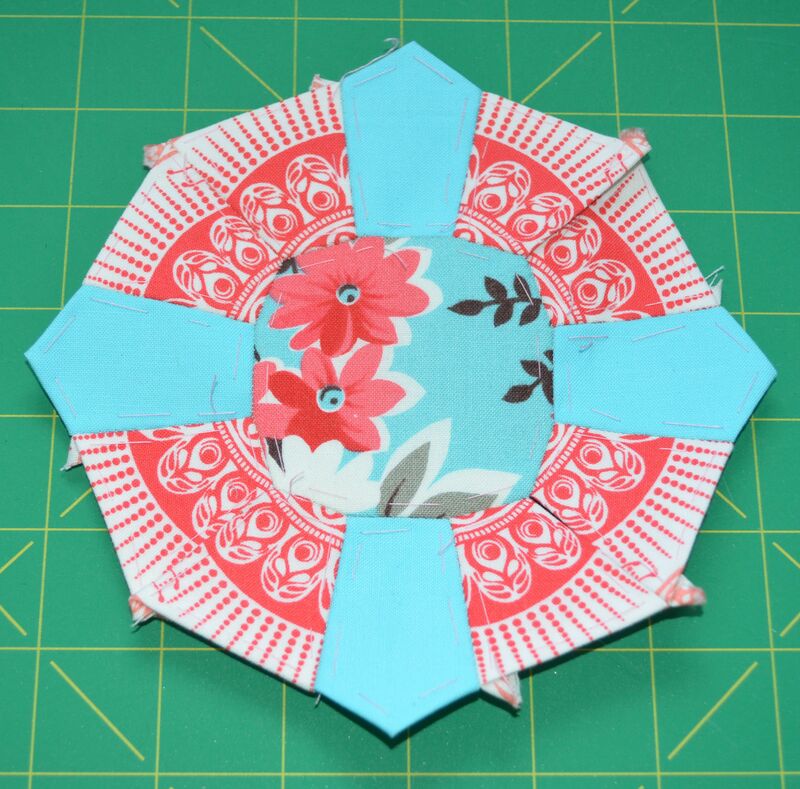 The pattern for this mini will be added to my tutorials once my partner has received it as I’ve named it after her. I don’t think she reads my blog but it’s better to be safe than sorry and I don’t want to spoil the surprise for her. One of the fun things about theses swaps is that you don’t know what you’re going to get until you hold the package in your hands. This was another projects on my FAL list and I’m so happy to be able to cross it off. 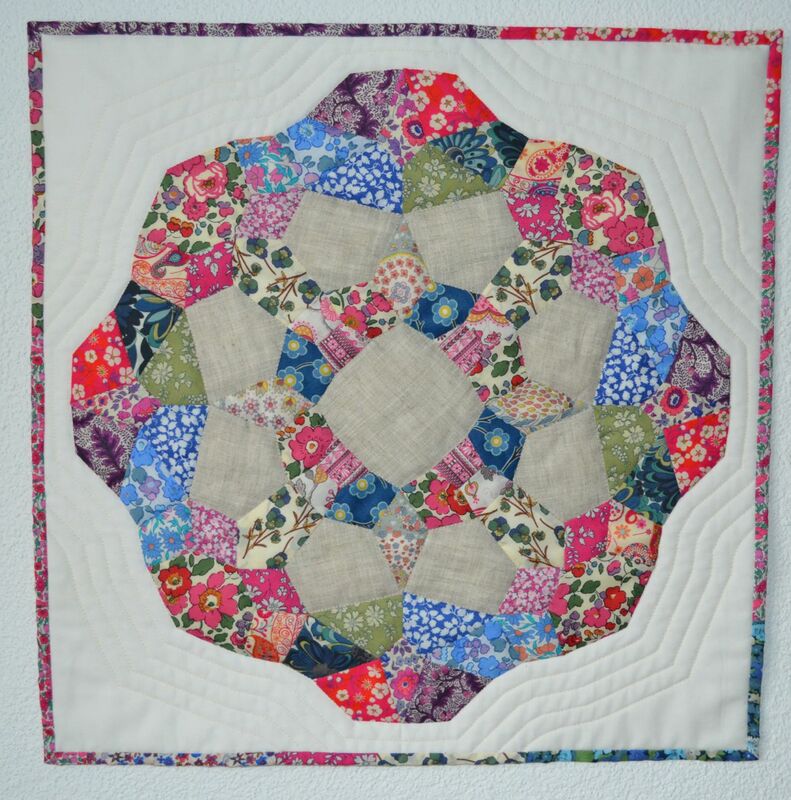 After a long debate with myself I’ve decided to enter my ‘Starflower’ mini quilt into the Modern Mini Challenge hosted by Ellison Lane Quilts. 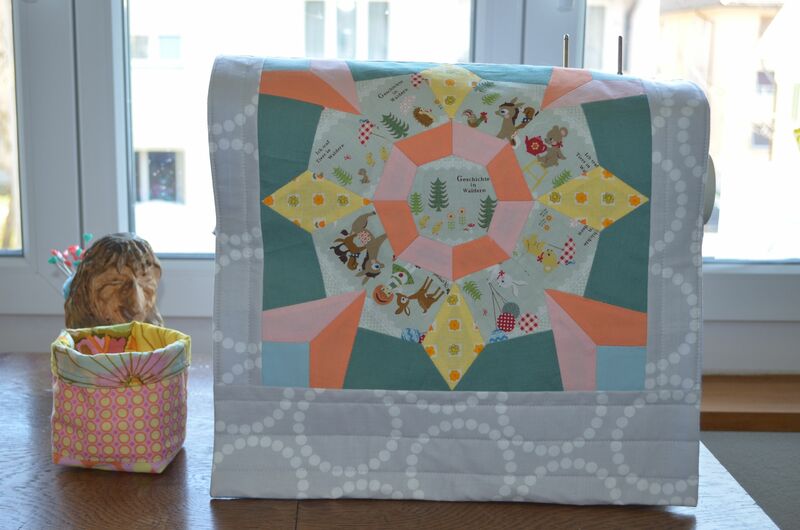 This little quilt is 18″ x 18″ and was made for the Doll Quilt Swap Round 13. I found a drawing of the ‘flower’ on the internet but couldn’t find either who had designed it nor a pattern for it so I sat down and started to draw out the pieces on a big piece of paper. The flower is English paper pieced and then appliquéd onto the white linen background. I then quilted it with some Aurifil 50wt by echoing the shape on the background and the centre and some stitch in the ditch between the pink and purple shapes. 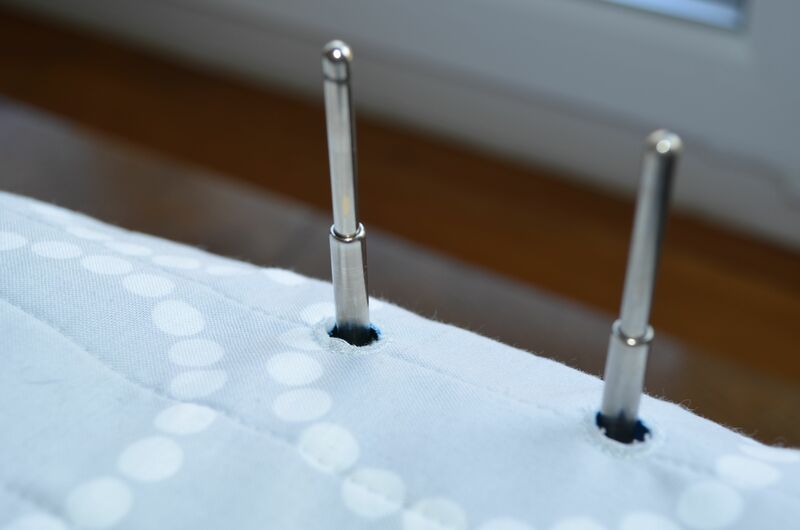 The binding is slightly wider, finishing at about half an inch. I thought a border would be too distracting but liked the idea of using all the fabrics in the scrappy binding. This was the first EPP patten I ‘designed’ and it was quite a challenge to get all the pieces to fit together and lay flat. 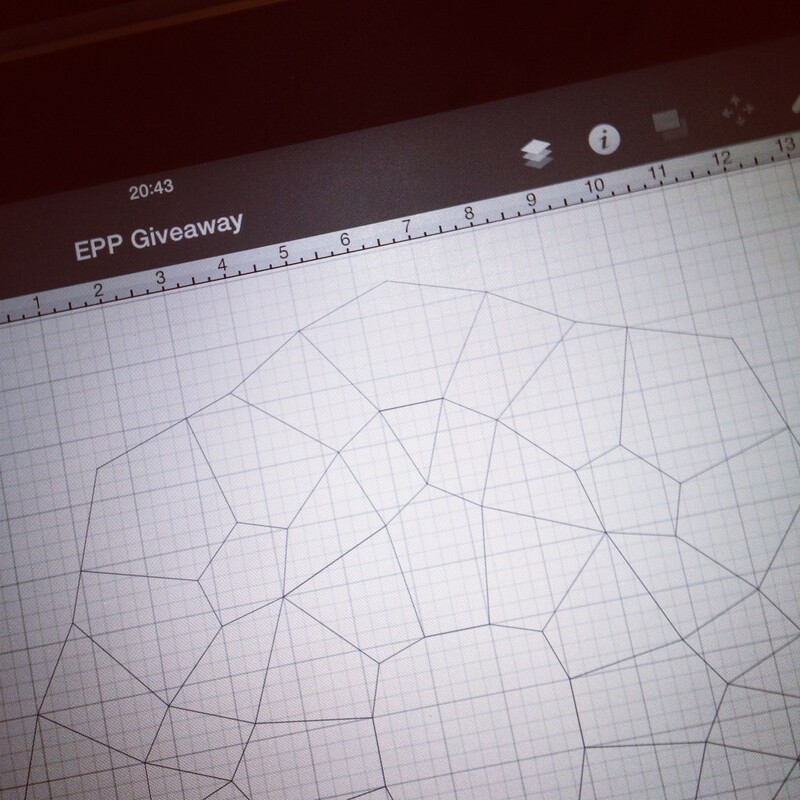 It was quite a steep learning curve but helped me a lot with designing my next EPP mini, Athea. You could say this was the start to my obsession with designing EPP patterns. There’s another one in the works as I’m typing this. Edited to add: I found the pattern, Girih Tiles by Endulzar, on Craftsy. If you would like to make this beautiful mini quilt you can buy the pattern here for $1.95. Although I drew my own templates for this mini I have now bought the pattern as I do not want to cheat this talented designer. 1. 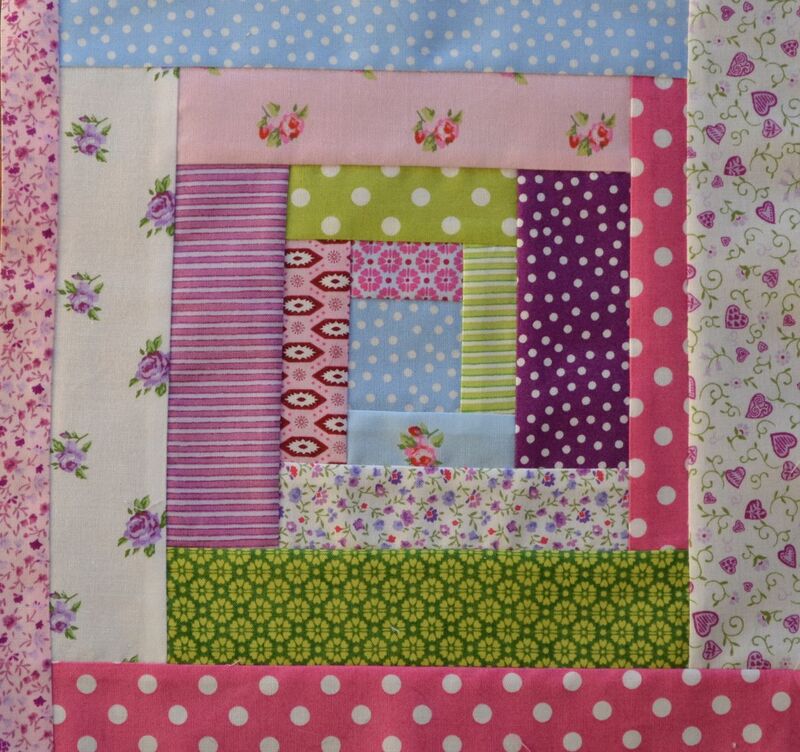 Little Miss Bossy-Boots’ log cabin quilt. I’ve got four log cabins so far and will have to make at least another sixteen, I think. I’m not sure I have enough fabric so I might have to be a little creative and add some sashing to make the quilt big enough. 2. 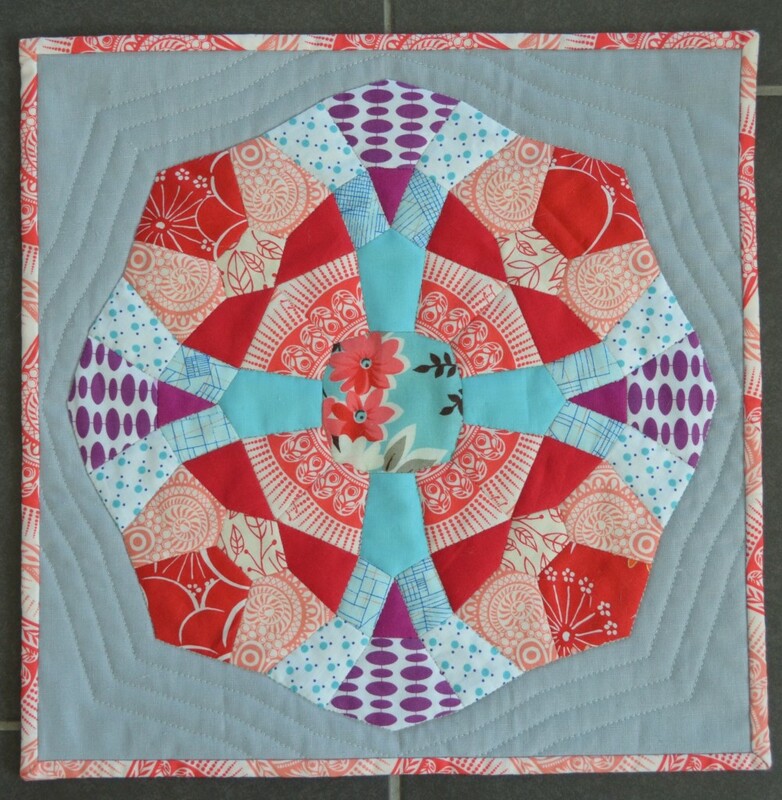 The Spring Carnival quilt. This is quite ambitious but I really want to bring it to the Fat Quarterly Retreat in July. My biggest problem here is that I’m fast running out of the stripy fabric I’m using for the ‘background’. I believe I have enough for two more columns, then I have to decide whether to keep it that size or choose a different fabric and add a frame around the stripes. I promised to make this bag last year (hangs her head in shame) and only started a very short while ago. I know it won’t take too long to make, I just need some uninterrupted sewing time which isn’t easy with Little Miss Bossy-Boots on holiday. 4. The Spring Version and Blossom panels. I’m not sure what to make with those two. I was wondering if I should turn one of them into a small quilt for the couch by adding a few borders and maybe making a bag with the other. Or maybe another cushion? Watch this space as I’m not sure yet what to do. Tote pocket or doll blanket? The jury’s still out. I think I’m going to stop here as I’d really like to finish everything on the list and there’s more than enough on there to keep me busy. Also, I know myself well enough that I’m sure I will start many new projects. I was playing around with TouchDraw, a brilliant app for the iPad that lets you draw patterns and design wonderful things. 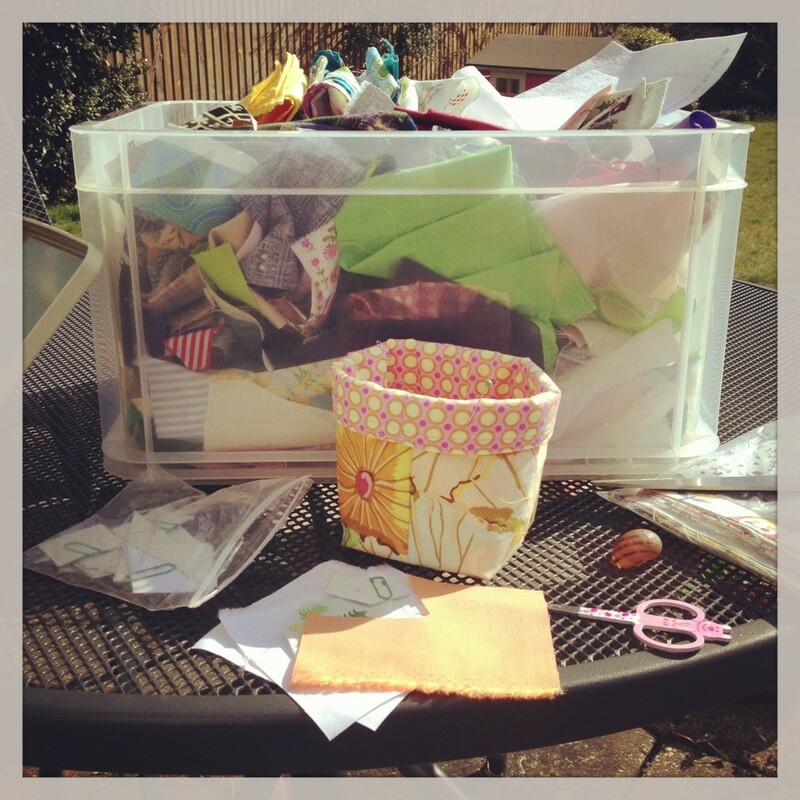 Thinking about Le Challenge (this month is ‘Geometrics’) I designed an easy geometric English Paper Pieced block, got a some lovely fabrics in muted spring-like colours and started stitching. 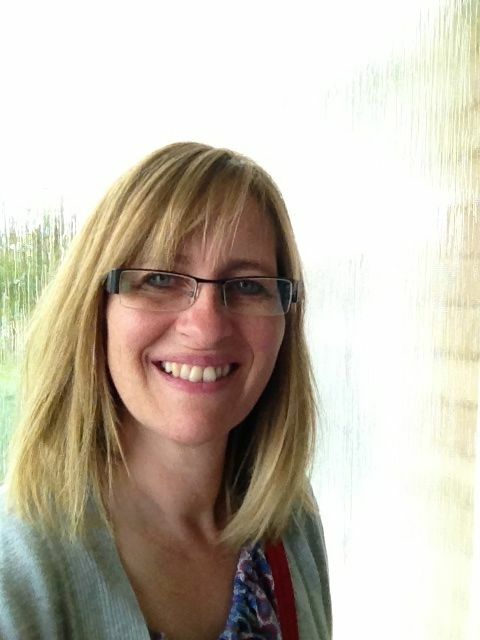 Tuesday was a lovely day here in Cambridgeshire so Little Miss Bossy-Boots and I spent it outside in the garden. While she was running around, climbing up and down the slide and playing with her toy kitchen (making yucky stews from leaves, flowers and some water) I took my scraps and paper pieces and got busy. I showed my progress on Instagram that evening. And then finished it yesterday evening. Eagle-eyed people might have noticed that I had to take the centre out and tilt it by 45 degrees. Actually I tilted it quite a bit more as I fell in love with the little hedgehog and wanted him at the top. Little Miss Bossy-Boots asked me to turn it into a quilt for her dolls. I was going to use it for a pocket on a tote but might turn into ‘nice mum’ and make it into a little doll quilt. Anyway, in the end I decided not to use it for Le Challenge. 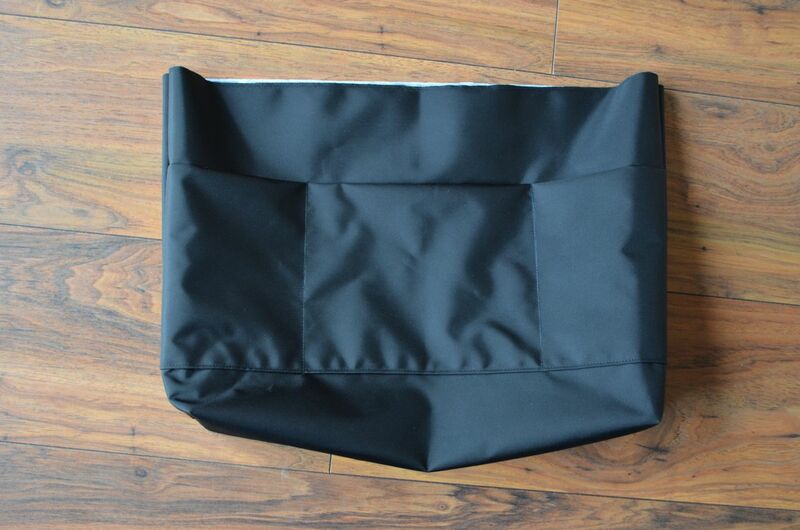 I’ve designed a different piece which I’m going to make totally out of solids. I’ll post a sneak peek once I get going. Interested in using the templates/paper pieces I designed? Click here to download In The Woods. This Finish-A-Long, hosted by the lovely Leanne of She Can Quilt, has really helped me finish some WIPs that had been lying around for quite a while. My list contained five projects and I finished four; not bad going for me. 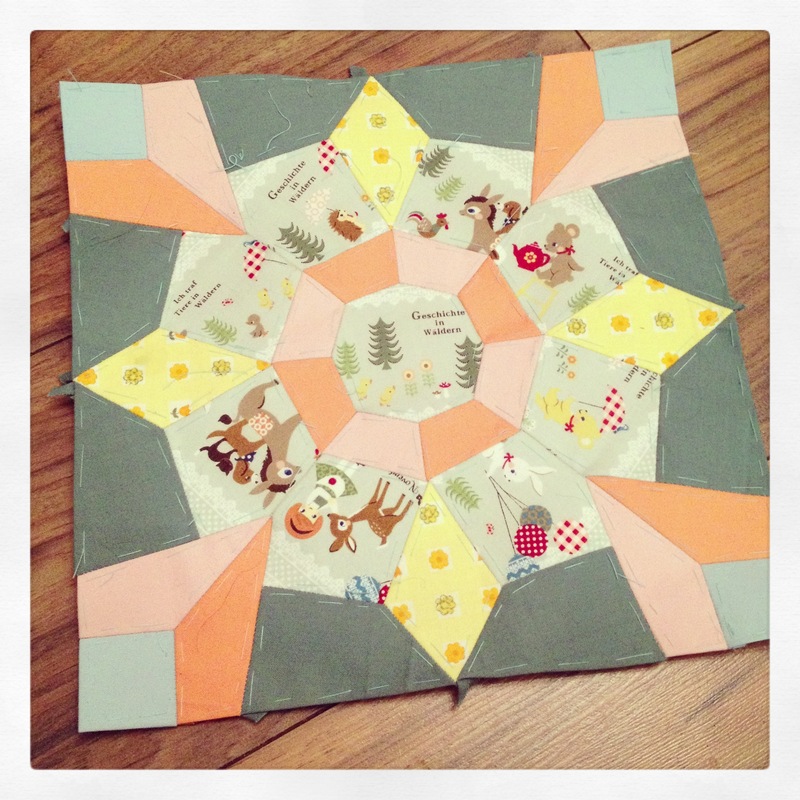 Of course, the one project I didn’t finish was the biggest one, Little Miss Bossy-Boots’ log cabin quilt. I’m going to put it on the list for the next quarter and make sure I start with it. 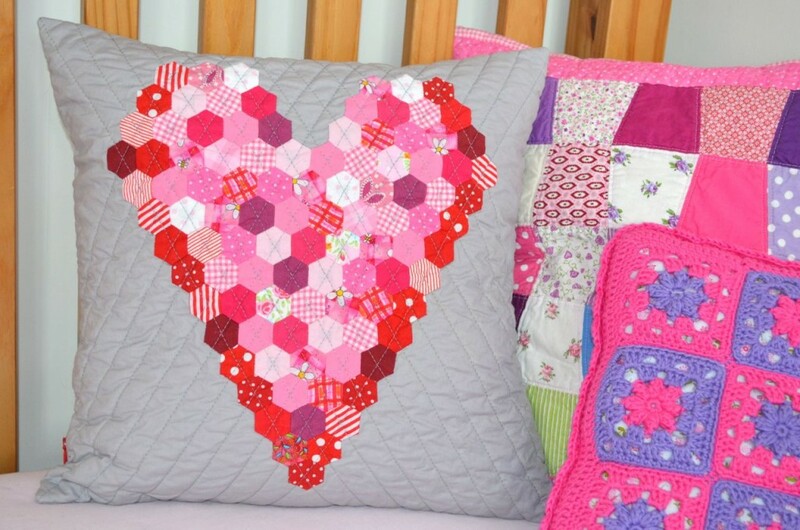 I was really happy to finish my Hexagon Heart which I started in April and was destined to raise funds for my local cancer treatment centre. The second finish was my Double Circle of Flying Geese, or Skein of Geese as I called it which I started at the Fat Quarterly Retreat in July. Once I got home I was a bit worried that I wouldn’t be able to remember how to foundation paper piece so I put all the bits and pieces in a drawer. Once I got everything out and got started I realised that not only did I remember how to do it, I also thoroughly enjoyed the process. It’s now sitting on my sofa being used every day. 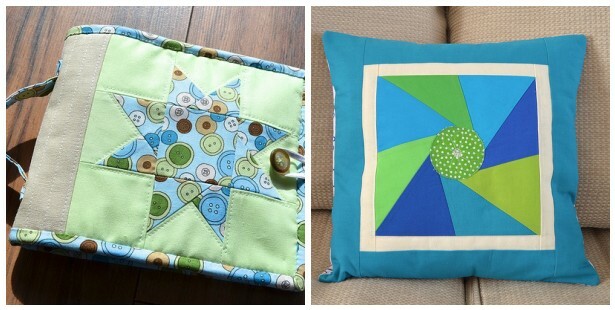 Two of my finishes ended up in my sister’s house: the sewing kit I made for her and the ‘Spin Me Around’ cushion. I realise that I only finished a few small things but I’m so grateful to FAL because without it I probably only would have finished the sewing kit and started a lot more new projects.